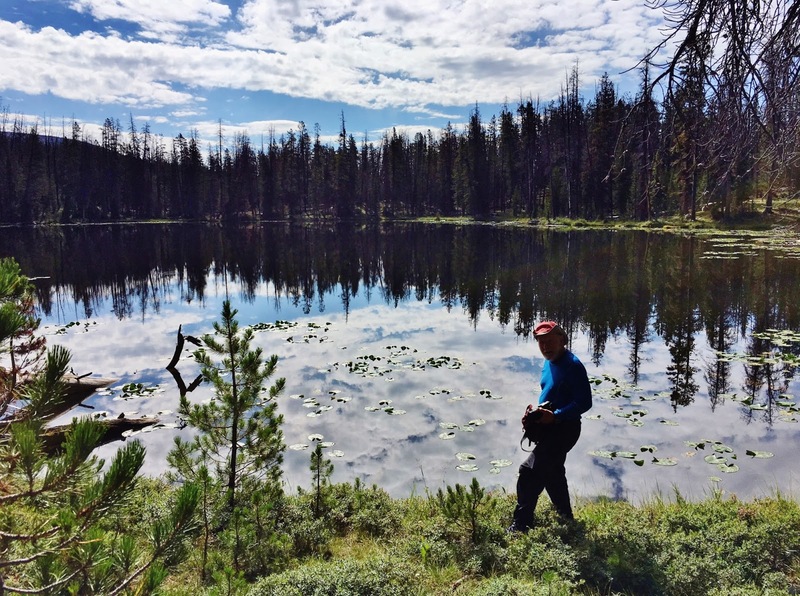 BACKPACK/EXPLORATION #2 – 2017 To THE GRANDADDIES & JEFF LAKE & The HIGHLINE TRAIL for 2018? 1. WHERE ARE WE GOING? My friend Ted Packard, and his son Mike are going with me…or me with them, starting at the GRANDVIEW TRAILHEAD, that is found up Hades Canyon from the North Fork of the Ducheesne River. We will begin hiking in the early afternoon of August 11th, going over Hades Pass, down to Grandaddy Lake, and continue to Betsy Lake. At the midpoint of Betsy Lake we will take the trail that goes down to Rainbow Lake, our destination being to get to Shadow Lake for the first night. 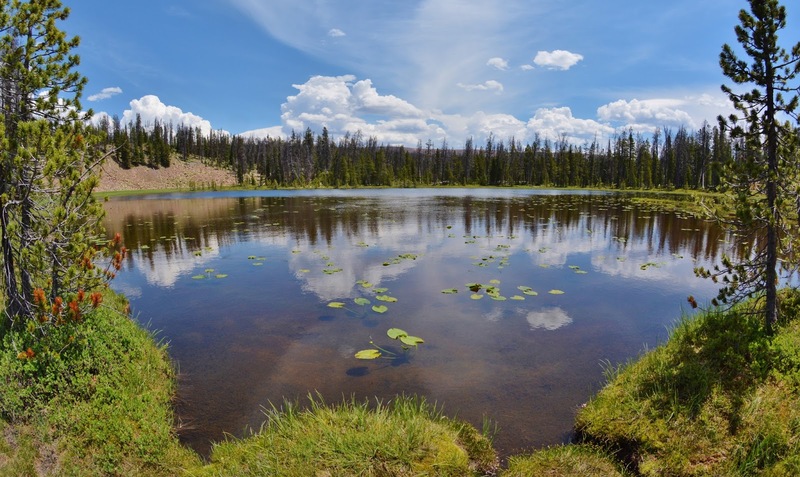 The SECOND DAY, we will take a day hike down to Rainbow Lake…. 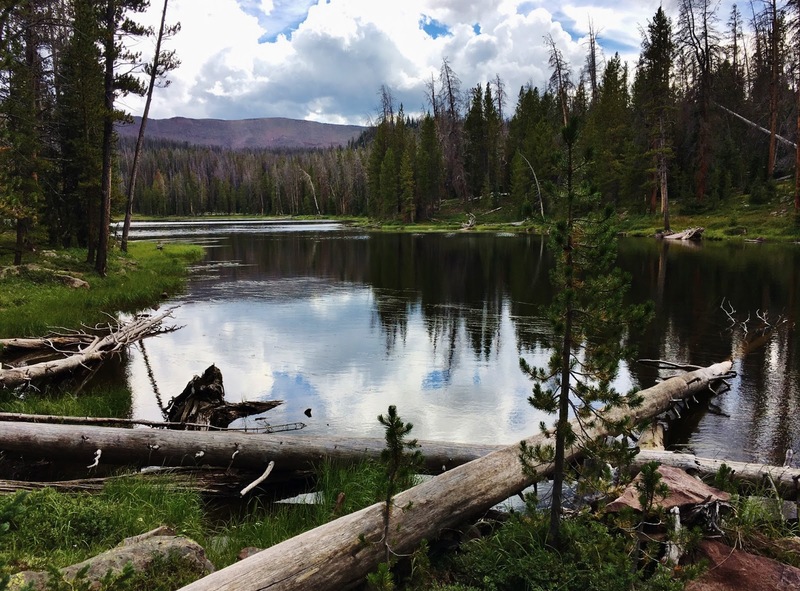 …..cross the bridge and at the nearby junction where one trail goes down to Rock Creek, we will leave the trail, and bushwhack east to Range Lake we see below…..
….. and from there continue bushwhacking east to find JEFF LAKE. From there we will return to our base camp on Shadow Lake. DAY THREE, we pack up and bushwhack our way up to Lodgepole Lake, following a faint, little used and not maintained trail. 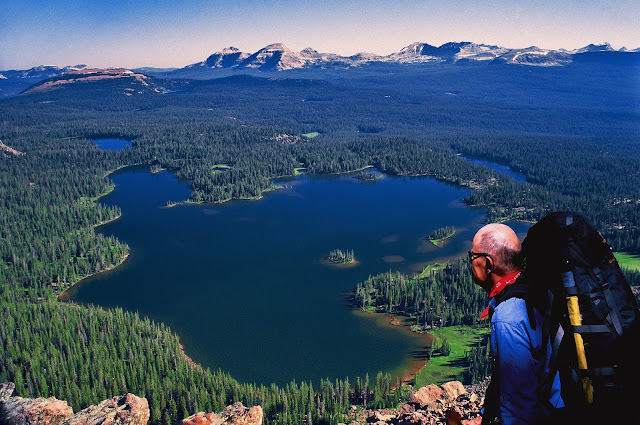 From Lodgepole we will climb up to Grandaddy Lake and hike around to the southern shore where we will make our camp……right down at the foot of the East Grandaddy saddle where Ted is admiring the amazing view of Grandaddy Lake & Basin. DAY FOUR, we will pack up, follow the trail from there up to the Hades Pass trail and follow the trail down to the Trailhead on Monday, August 14 and return to the Wasatch Front. 2. I will not have this time a SPOT TRACKER which on all previous trips over many years I have used, but I will have a satellite phone provided by SKYCALL SATELLITE, and this time will not be alone as I have almost always been during the last 15 years and 2,000 miles of the HIGH UINTAS WILDERNESS PROJECT. and his son Mike you see with me below at the Grandview Trailhead. By the way, the parking lot on the day we left the Trailhead was the fullest I have ever seen it in my many years of frequenting this choice Trailhead. Some photographs will have no captions as they are self explanatory. Our objective was mainly to explore, find and photograph JEFF LAKE which had escaped me on Backpack #1-2017 when I did find and photograph RANGE LAKE as shown in the Introductory photographs. These were two named off-trail lakes in the Grandaddy Basin that I had never seen during all my years of backpacking to the Basin–lakes never mentioned, nor pictured before by anyone! 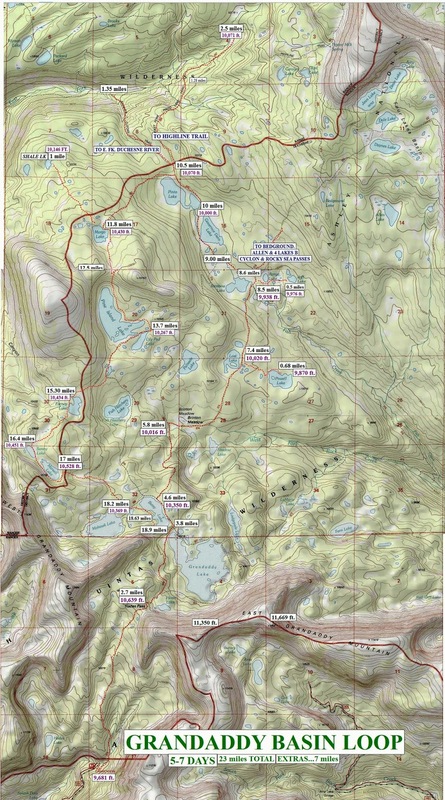 They are seen in the topographical map below, located in the lower middle a little to the right, due east of Rainbow Lake. Originally our plan had been to hike past Grandaddy Lake, on to Betsy Lake and at mid-point take the trail to Rainbow Lake, but stop and camp the first night at Shadow Lake. However, we got a late start, and soon were passed by a string of horse packers who said they were going to Shadow Lake. So, for those two reasons we altered our announced plan and decided to camp above Grandaddy Lake. This picture, on August 11, 2017 can be compared to photographs inserted in the report on Backpack #1-2017 to show the stream flow in different years. Near the bridge we found these boots with soles pealing off teaching us the obvious lesson that one should have reliable foot gear and equipment. 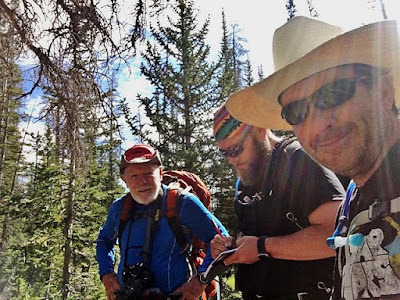 I learned that lesson the hard way on our 1954 two week backpack across the Primitive Area (me, Ted & Charlie Petersen), which story will be told in the book. This was our camp the first night above Grandaddy Lake, about 3.5 miles from the trailhead. I carefully set up my tent with the opening facing south to be able to pick up the satellite the next morning without having to get out of my bed–for the sat phone report to KSL OUTDOORS RADIO, which was successful the morning of August 12th, much of the discussion about High Altitude Sickeness that had shortly before taken the life of an 18 year old Salem Explorer Scout near the Chain Lakes in the Uinta River Drainage. That kind of tragedy can be avoided by each group having a SATELLITE PHONE. Click on THE PODCAST (Aug. 12) my participation from 4 min. to 11:20 min. Note: On the podcast, as I explain what I do for High Altitude Sickeness, Tim mentioned that Charlie, who was in studio, was “shaking his head,” which was understood that Charlie wasn’t in agreement. On returning the sat phone to Russ Smith, I asked him about that, and he said “Charlie was in agreement with everything you were saying.” So Tim should have rather said Charlie was “NODDING HIS HEAD” in agreement. This is my very light, small one-man tent. Perhaps a comment about how I do things will help someone. Some of my gear I need in the evening, or early the next morning, goes into the tent lined up along each side, The remainder is left in my backpack that I put in the vestibule for rain protection–which was needed each of the 3 nights. The food is hung safely in a tree at least 6 feet from the trunk, and between 12-15 feet off the ground. In the morning I do my “beauty treatment,” which includes, among other things, a bit of sun-protection, and then insect repellant (at least 98% Deet) which I also apply to the back of my T-shirt so mosquitoes won’t bite me there. I begin Take 1 of my supplements. Take 2 will be taken with my breakfast. Take 3 will be put in a small plastic bag in my pocket to be taken on the trail. See my article ANTI-AGING CHALLENGE for details. I stuff my Golite Quilt into its stuff sack (the gray with black straps–weighs 15 oz.–effective to 20 degrees & much more comfortable than a mummy bag), and with other things already used, pile them outside on top of my pack. I deflate the air mattress, roll it up and along with the rest of my stuff pile it on top of the pack, leaving the tent empty. You’ll notice on the far left a purple container which is my one quart urinal so I won’t have to get up and out of my tent during the night–bought at Dollar Tree with liquid soap. I put my mountain running shoes on & stand, step outside, pull the stakes and with the free-standing tent–lift and shake out any debris. If wet I hang it in a tree or stand it up–as seen below– to drain and dry. then have breakfast, pack and ready to get on the trail. As was the case in Backpack #1-2017, also to the Grandaddies, several hikers stopped to say hello, a couple of them recognizing me from this website. Here are pictures of some of them, and others. One who recognized me was BEN PARKER, who since has sent me a couple of pictures he took, which I’ll insert below. THANKS BEN! Many were seen on the trail and not photographed, mainly because I all of a sudden had a defective zoom lens and so used it sparingly, but here are a few photographs of some of the great people we met that I did photograph. Mike and Ted admiring the wonderful view along the Rainbow Lake Trail, with East Grandaddy Mountain in the background. At the same spot a great two family group stopped to also take in the view. WOW…. two great families really enjoying the High Uintas Wilderness! Soon we were at Brinton Meadows and the junction where the trail takes off for Palisades Lake, and from there on to Pine Island Lake. It was here I ran into Mike the last time, a few years ago, when he was with his Backpacking Class from the University of Utah. This was the first backpack I had taken in several years with hiking companions and it was a fascinating experience. I have not hidden the fact that in my 82nd year I have had to take it slow and easy to be able to do what I have done. In fact I have confessed that my pace is embarrassingly slow, so I usually prefer to go alone and be able to do it my way. Ted and Mike approach six feet tall, and then there is me, 5′ 5″ and shrinking! We are like Mutt & Jeff, for those of you who might remember the comic strip duo. Coming to a log across the trail, they would just step over it, while I had to take a detour around it! To get across a small stream they would just step over, while I had to back off 10 paces and get a run at it and jump–sometimes making it, and sometimes….SPLASH! On the trail, if I was last I had to totally wear myself out and be miserable attempting to keep up. If I was breaking trail, they would constantly be stepping on my heels forcing me to violate my comfortable slow pace….and soon I was ready to throw in the towel! Mike, the young gung-ho mountain man, would go first at his pace. 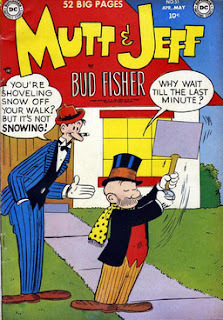 Ted, always….even from 1952 on….was always a better hiker than me, would go second and soon falling behind Mike. I would go last at my pace and try my best to not pressure myself to keep them in sight. So, quickly there would be separation as you see in the photo above, and it increased rapidly–Mike way out front, then Ted….soon both of them out of sight, and trailing behind was Little Andy, the “Jeff” of the crew! Each time we would start, we would agree to stop and meet at a certain place. So Mike would stop and wait for us. By the time I arrived they had rested and were raring to get going, but had to rest a little more, giving me a chance to also get revived! From there on all went better, even though I did have a tough time, just as I did a month ago on Backpack #1, and will freely admit that it wasn’t fun like it used to be–all of which has me concluding….again, that I best get working more on writing the book—like many have told me on the trail, “BEFORE IT’S TOO LATE” — like as though I wasn’t going to live forever? — as to not do so would soon have me GONE! which I’m not ready for yet. More will be said about the above dilemma in the book, as there are individual differences for many different reasons. Mine begins hurting like crazy after 30 minutes! Wildflowers were abundant, and the meadows lush and green…..and mushrooms were coming up all along the trail. With my zoom/close-up lens on the blink I only got a few extra VISIONS OF NATURE.…this time mushrooms that were large enough to not need a fully functioning lens. At about the the midway point along Lost Lake the trail to Powell Lake takes off at the spot seen below which I have shown in my photo/essays and YouTube videos of THE GRANDADDIES, but on Backpack #1-2017 I never saw it! The faint trail you see to the right of the large rock is an example of trails not maintained by the Forest Service to help this be a true Wilderness. No sign either pointing to Powell Lake. Below you see the reason why in July I just walked by the spot without recognizing it. The trail was disguised, or obliterated by downed timber! About half-way past Lost Lake you come to the bridge seen below. About 20 yards past the bridge going down the trail you will notice to the right a pile of rocks on top of a large boulder. That is where the trail takes off and shortly joins the trail on the other side of the downed timber. By the afternoon of the 2nd day we made the mile or so from Lost Lake to Rainbow Lake we see below. Below we see Mike relaxing in our Rainbow Lake camp. 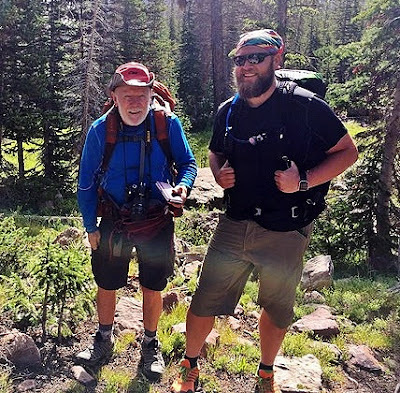 This–for me–young man was what my dad would have called, “A PRINCE OF A MAN!” Always sharing, always understanding & helpful–for example on the first day when up the trail doing the switchbacks, Ted realized he had left his trekking poles in the pickup. Mike immediately volunteered to go back and get them as we continued up the trail. He of course had no problem catching up to us, so Ted had his beloved poles. But, interestingly Ted then forgot them again, leaving them at the Rainbow camp! 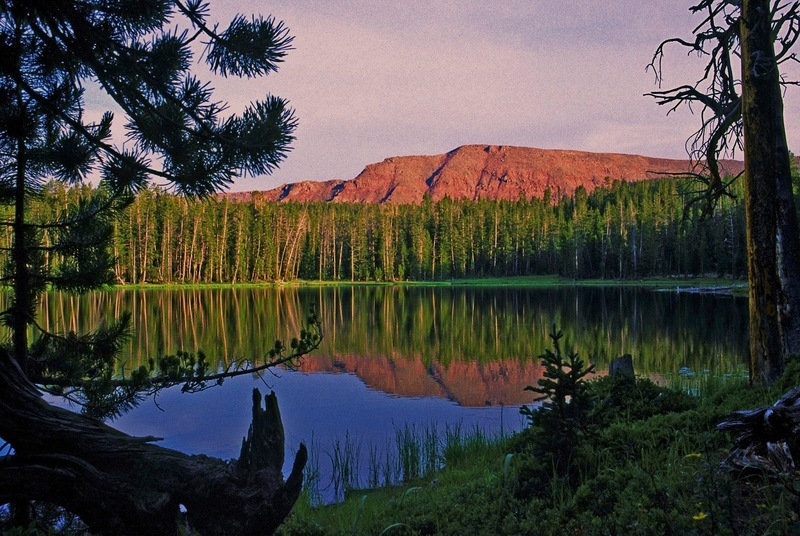 Sort of sounds like Ted is becoming “an old guy” like me, as I also left scattered around some of my stuff–my Golite poncho at Jeff Lake, my High Uinta hat & long sleeved blue shirt at the Defa Cowboy Cafe! THANKS MIKE….LOVE & APPRECIATE YOU! Note: Not to diminish the help Mike gave me, I could have made it fine doing it my way, but would have been slow –maybe an extra 30 minutes getting to the Trailhead. Note: Of course, Mike, and his wonderful character, is a reflection of a great upbringing by a great dad, Ted, & mom, Kay. Interestingly, without knowledge of what the other was doing, we both ended up with exactly the same tent, the same Therm-o-rest air mattress, and the same inflatable pillow! We even had a little time to go fishing, Ted catching a quite nice Eastern brook trout that was enough for all three of us….my portion you see above, cooked in aluminum foil. The morning of the 3rd day we did a two mile off-trail exploration, first passing by RANGE LAKE we see below which I photographed in July using a fish-eye lens, distortion corrected in Photoshop–actually making it look a bit larger than it really is. Once again I had all kinds of problems with my camera and extra lens, but finally managed to salvage a few pictures I pasted together of JEFF LAKE you see above–but the convuluted distortion this time making it look smaller than it really is! Above & below are the other two sent me by Mike and Ted, for which I’m very grateful. As is the case with Range Lake, Jeff Lake is not mentioned by the Fish & Game or DWR, as a fishery. They don’t even have numbers often even given to lakes even with no fish, but….we all swear that we saw a few rises in Jeff Lake–so someone out there with an adventurous spirit has got to get to Jeff Lake and do a little fishing–and then report to me, PLEASE! Mike found what we concluded was the heart of a weather balloon that had come down there. I’ll insert a few pictures of it and the self-addressed, postage paid envelope to return it. Mike hauled it to civilization and it has been sent in the mail. That same day, Day 3, after getting to Jeff Lake, we packed up headed up the trail. 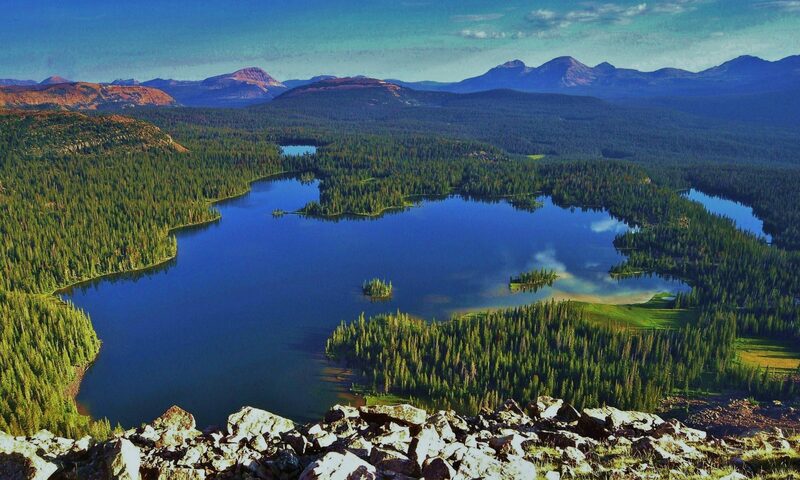 From the junction of the trail to Shadow Lake, Mike did as my pre-trip plan had outlined, and bushwhacked up what for me 15 years ago was a faint, un-maintained, but passable trail from there to Lodgepole Lake–that is seen below on the far right. Now I suspected it would be very difficult with a lot of dead-fall, so Ted and me followed the maintained trail up to Betsy, then around Grandaddy where we met Mike and set up our last camp in the pines in the lower middle of the picture . Mike reported that he found no trace of the “faint trail” I had followed 15 years ago, and his bushwhacking was a real challenge just as I had suspected. I might add that the Forest Service purposely has stopped maintaining such trails to help the area become a legitimate “Wilderness.” It is the same reasoning that has them not placing signs and distances to all the many lakes, such as mentioned previously for lakes like Shadow & Powell. On Day 4 we packed up and, hiked along the southern shore of Grandaddy and up to Hades Pass and down to the Trailhead. It rained every night some, and often threatened to rain during the day, but never did. We were hurrying along the last 15 minutes before the Trailhead to beat a storm…but all of a sudden a student from Utah State University was taking a survey, so we gave him 10 minutes of our time…. ….just enough to finally be rained on before getting to the Trailhead! In the 4 days we had backpacked around 20 miles and accomplished the main purpose of finding Jeff Lake, but photographically didn’t do as well as hoped for. My Nikon camera body is still fine, but the zoom lens–that cost more than the camera body, has gone the way of the world–and too expensive to replace right now, so I apparently have no choice but to end the exploration/photographic phase of my project & get to writing! My Nikon body, with a wide angle lens 12-24mmD which is huge to eliminate distortion. It’s the lens I should have had on many trips in recent years, but it is big and weighs more than my sleeping quilt/air mattress/inflatable pillow combined, so as I increasingly have needed to reduce pack weight, I stopped backpacking with it. BIG MISTAKE…NOW REMEDIED BY FORCE! But, MISSION ACCOMPLISHED HAVING GOT TO BOTH RANGE & JEFF LAKES. IN A PACKAGE THAT WILL BE FASCINATING & INSPIRING….WITH THE HISTORY, THE LEGENDS, & MORE, INCLUDING THE SURVIVAL STORIES THAT WILL SAVE LIVES! where reportedly the Hilliard Flume started. I have searched for it several times….fruitlessly, as has Bernard Asay, Trail Supervisor for the Forest Service on the North Slope. I think I now know where it is, and if all goes well will spend Saturday, the 19th, searching & be in that area over the weekend for the eclipse. That is how I will celebrate the GOLDEN ANNIVERSARY of my work among the Mayans in Guatemala on August 19, on that day in 1967 having crossed the Guatemalan border to begin the Andersen Family Private Peace Corp work that is today that of the GUATEMALAN FOUNDATION. Previous PostPrevious HELP FOR THE HIGHLINE TRAIL….FOR WHICH WE ARE PROFOUNDLY GRATEUL!